Bucks County was an original county in William Penn’s newly formed Pennsylvania province and has carried the weight of history ever since. Industrial power in the region expanded in the late 1700s as Irish laborers sacrificed life and limb to construct a section of the Pennsylvania Canal and the Durham Furnace. In 1921, a gruesome train wreck claimed the lives of twenty-seven people, forever leaving its tragic mark on the busy rail lines emerging from Philadelphia. Raised a Quaker in Doylestown, James A. Michener went from local English teacher to Pulitzer Prize–winning author, leaving his philanthropic mark at the art museum named for him. 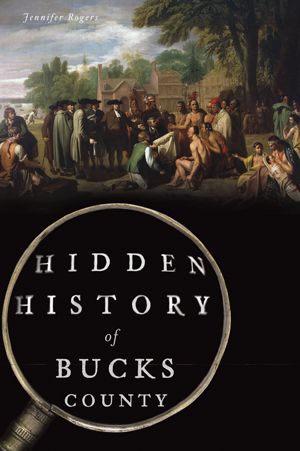 Join author Jennifer Rogers as she recounts the lesser-known history of Bucks County. Jennifer Rogers is a passionate historian who dedicates her time to the preservation of local history through her volunteer efforts with several organizations. She was appointed and continues to serve as an active board member of the Upper Southampton Historical Advisory Board, as well as a board member of the Craven Hall Historical Society. As a graduate of Pennsylvania State University, Jennifer Rogers obtained her Bachelor of Arts degree in American studies, with a minor in English. While studying at Penn State, Jennifer interned at the Spruance Library at Mercer Museum, where she discovered and transcribed a Civil War soldier’s diary, completed two undergraduate research projects and also presented her research and transcriptions of the Bucks County Civil War soldier’s diary at the Pennsylvania Historical Association’s Annual Conference. For more than two years, she was the collections manager and preservation and communications associate for the SS United States Conservancy.